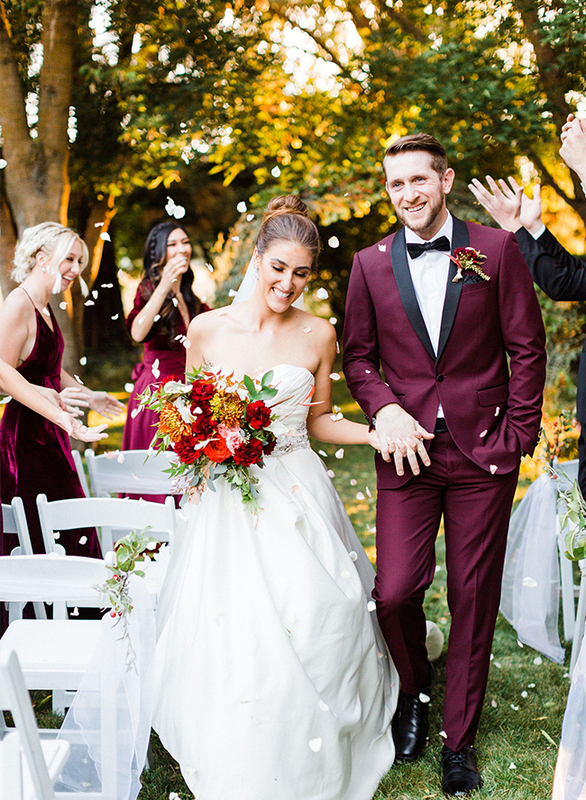 Okay, we are getting all the feels from this elegant burgundy wedding inspiration on the blog today. 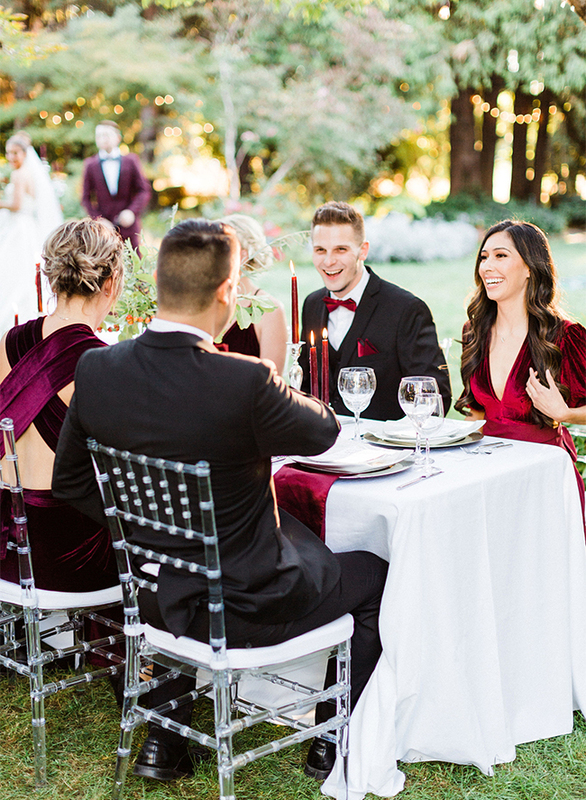 Everything from the groom’s suit, to the bridesmaid’s velvet dresses, is making us feel like we are a part of an enchanted night. 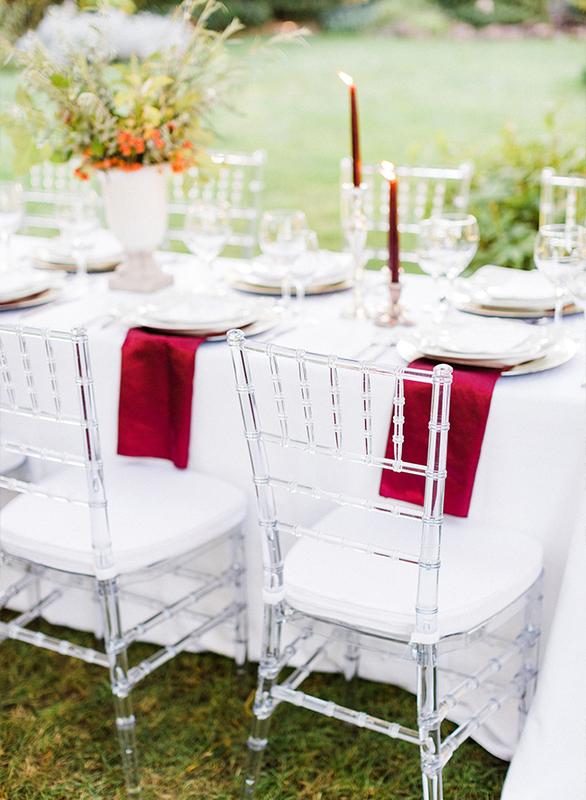 It just doesn’t get more elegant than this. 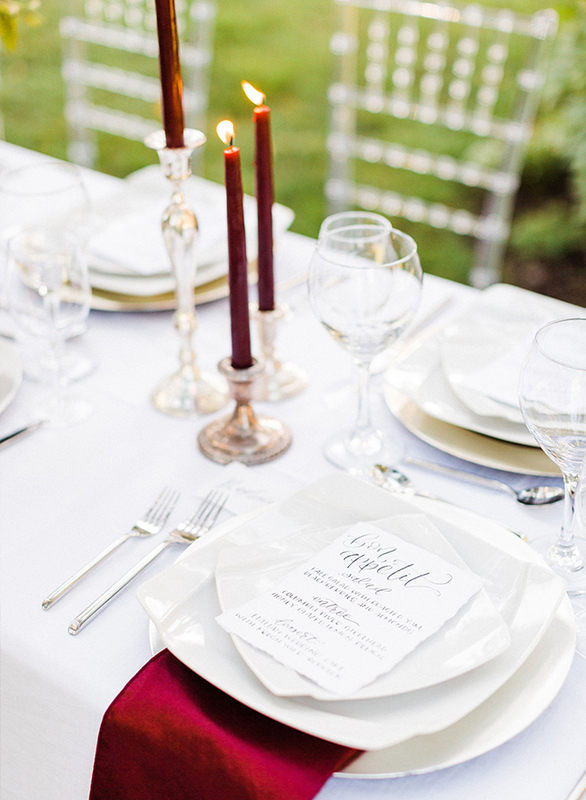 And that romantic hue doesn’t hurt! 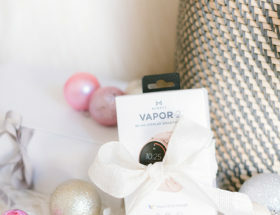 The ambiance is next level with details like gorgeous rustic inspired florals and adorable mini bird cages used as bridesmaid bouquets. 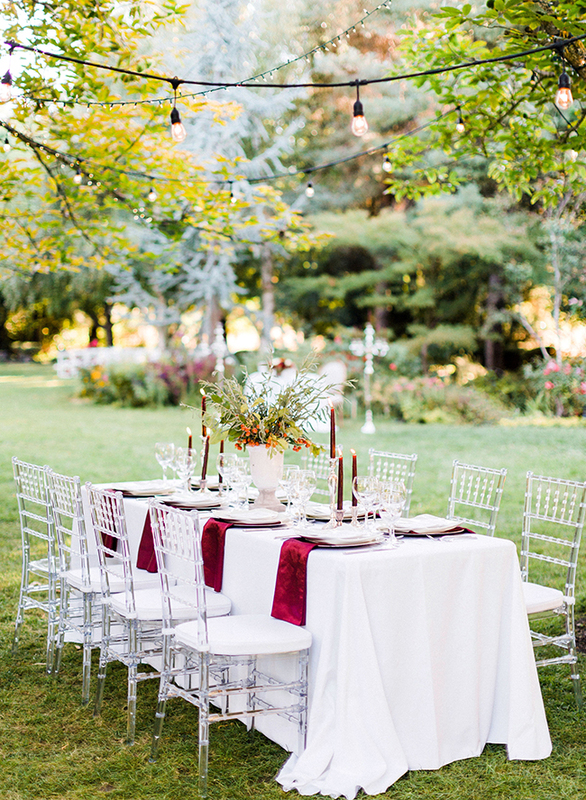 Every aspect of this styled wedding will leave you feeling inspired! 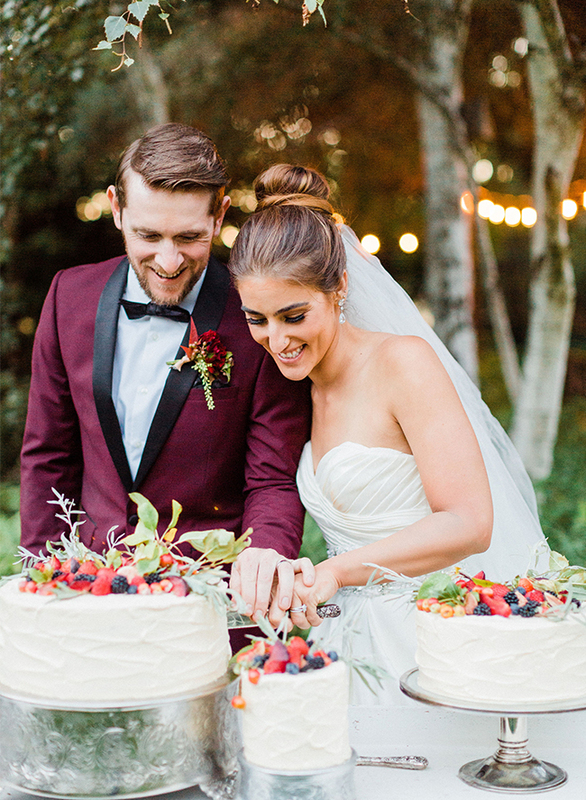 My vision for this styled shoot was to marry (no pun intended) wild, natural florals with classic, elegant style. 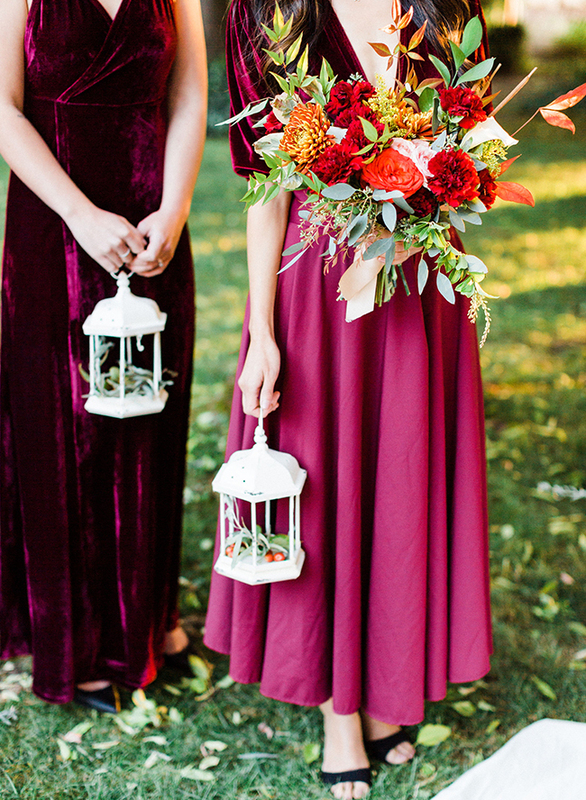 All of the inspiration for the decor, attire, and details came from that starting point, while being further embellished with the tones and feel of autumn. 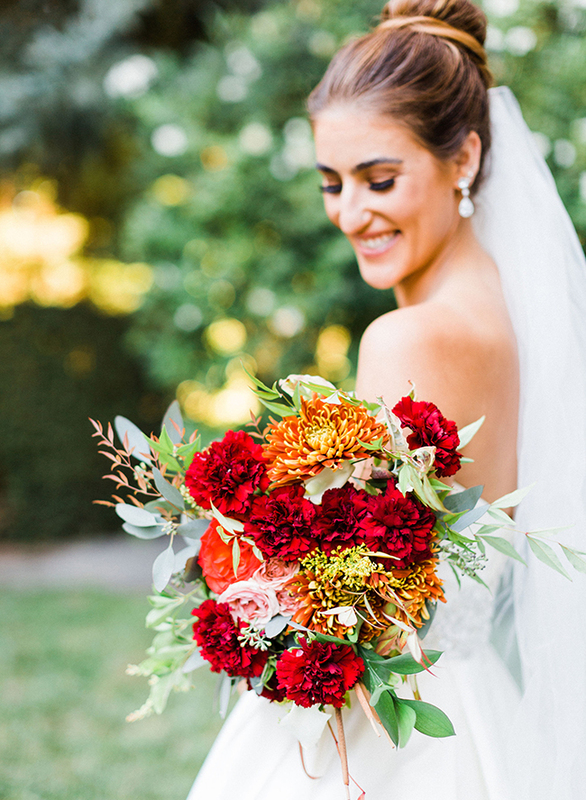 The florals for this shoot were stunning and oh-so-unique. 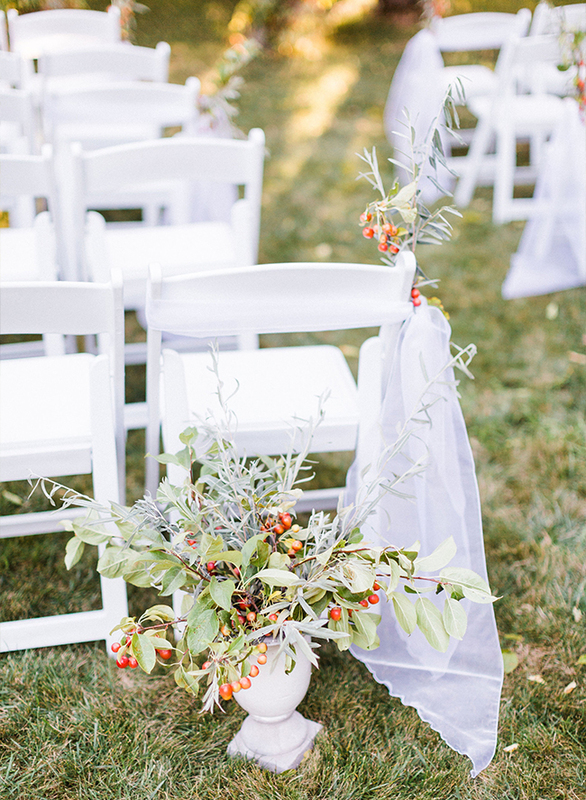 River willows and tiny crab apples decorated a stunning circular floral installment as well as lining the aisles and adorning the tablescape, while the bridal bouquet and groom’s boutonniere incorporated more classic blooms. 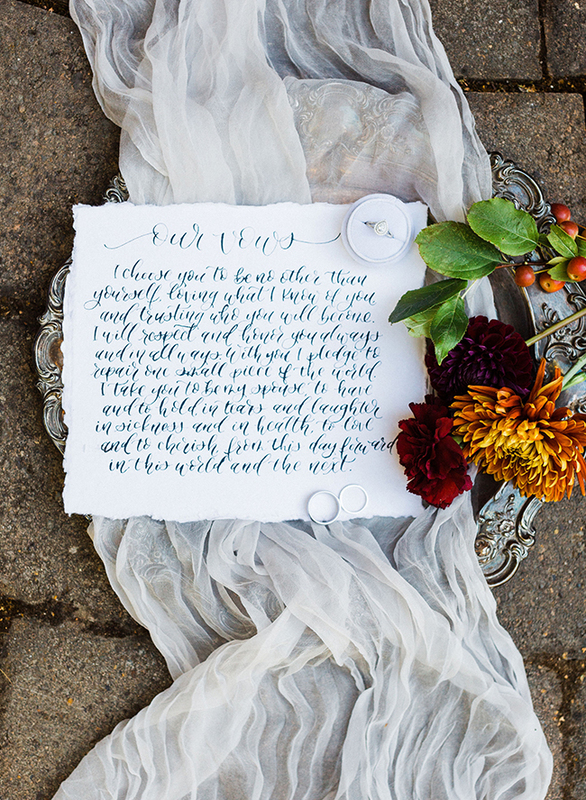 The little cattails peeking out of the back of the bridal bouquet were one of my favorite details of the shoot. 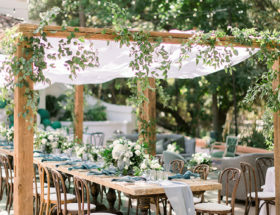 The florals tied in perfectly to the elegant garden setting, which showcased many types and textures of plants as well. The makeup for the shoot was all based on a natural look with glowy skin that brings to mind the golden tones of the autumn sunlight. 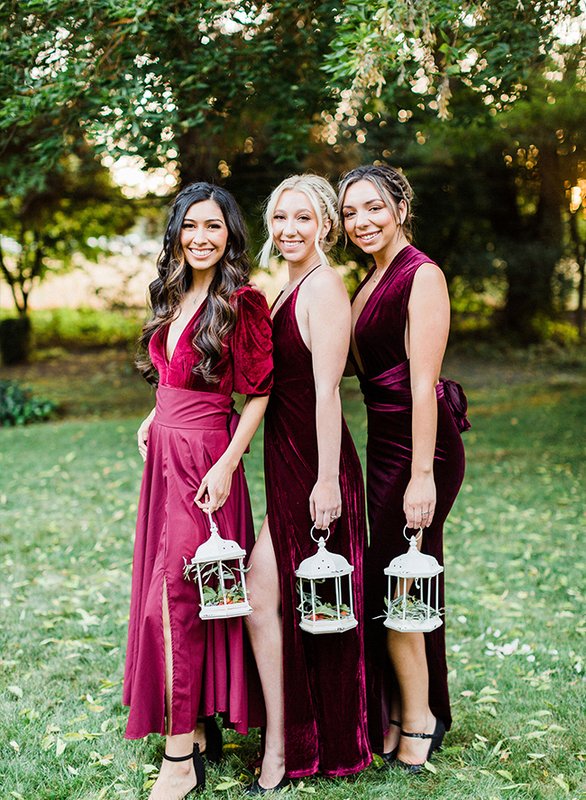 The hair for the bridesmaids was full of texture in the form of waves and braids, while the bride’s classic and clean updo brought a touch of elegance. 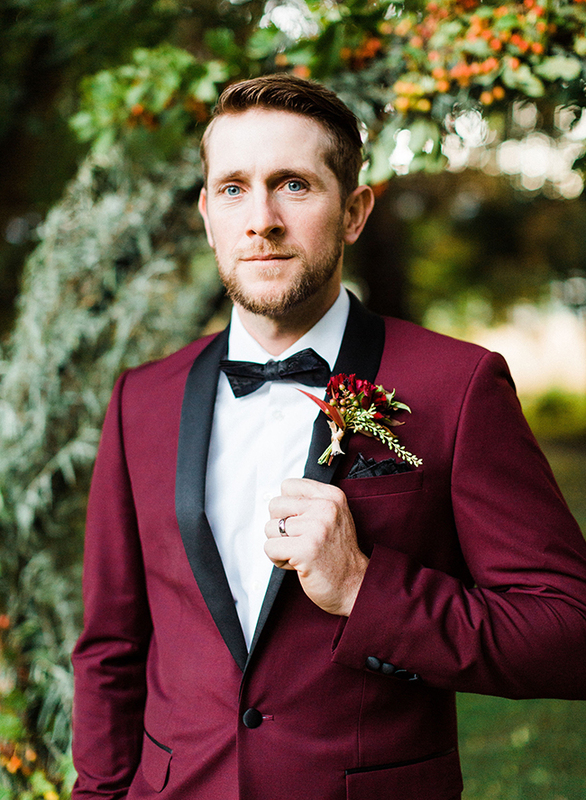 All of the attire played strongly on color and texture, with a bold burgundy suit for the groom and paisley silk bow tie and pocket square. 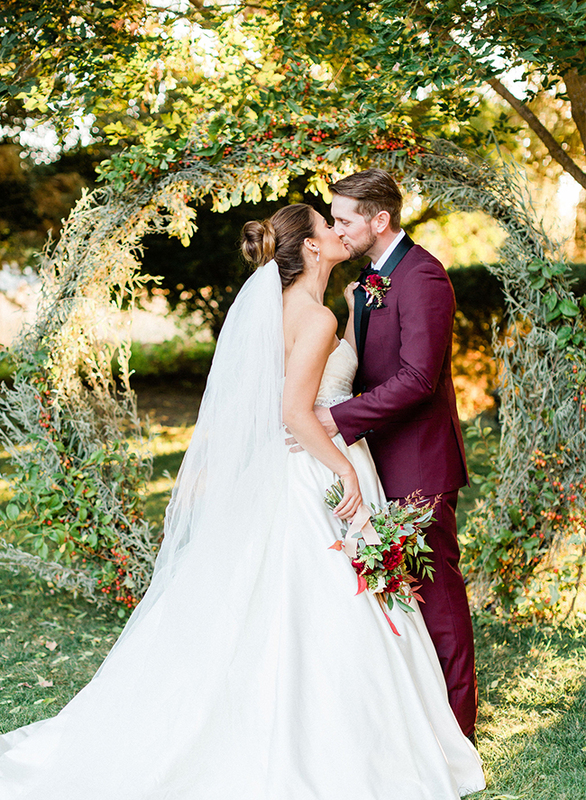 The bridal gown was a classic a-line shape with a short train and delicate beading and pleats on the bodice. 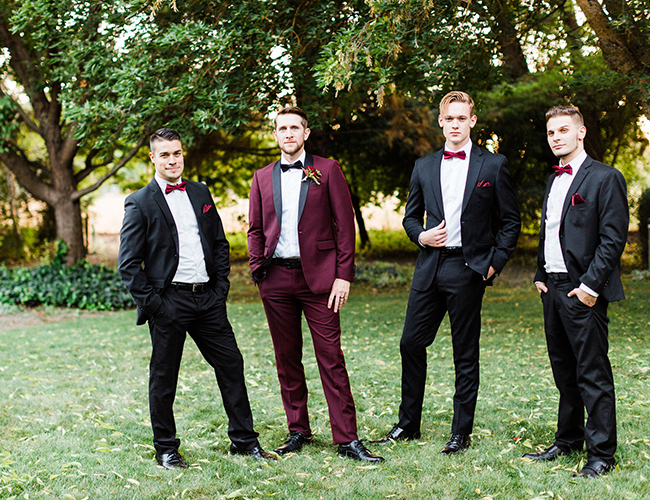 The bridesmaids wore mismatched attire in varying textures, all in some form of burgundy velvet, and the groomsmen sported classic black suits with burgundy accessories. 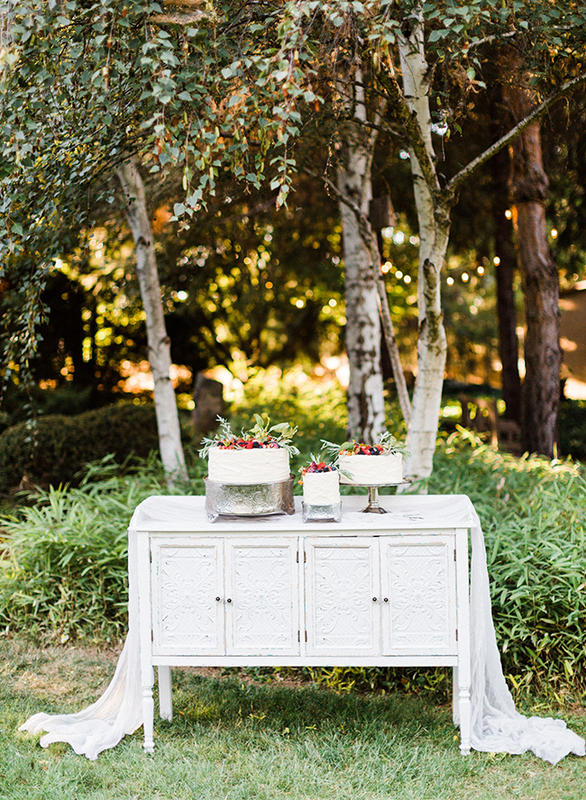 Those same ideas of modern style and rich textures wove into the calligraphy, with charcoal ink on handmade paper, the cake, with rippling buttercream and fruit, and the tablescapes, with patterned plates, silk chiffon, satin napkins, and elegant chivari and linen chairs. 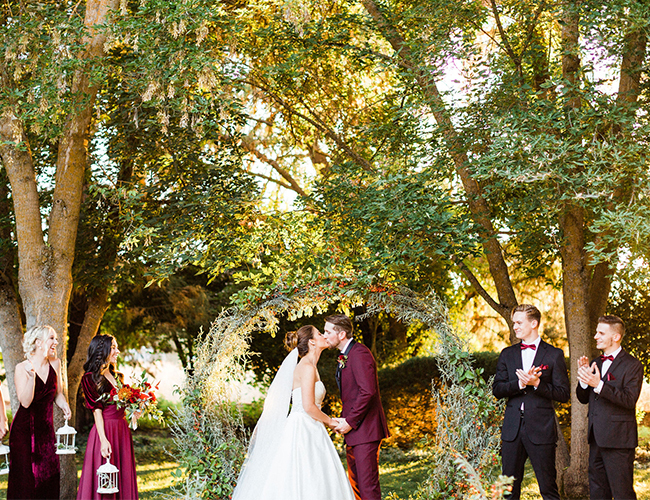 I felt so privileged to work with all of the talented vendors who collaborated on this shoot and was so happy that the couple, Debbie & David, agreed to model for us—they celebrated their 10th wedding anniversary mere days after the shoot and their enduring love and tenderness for each other truly breathed life into this magical project. 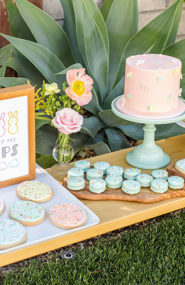 There’s more rich-in-color wedding inspiration where this came from! 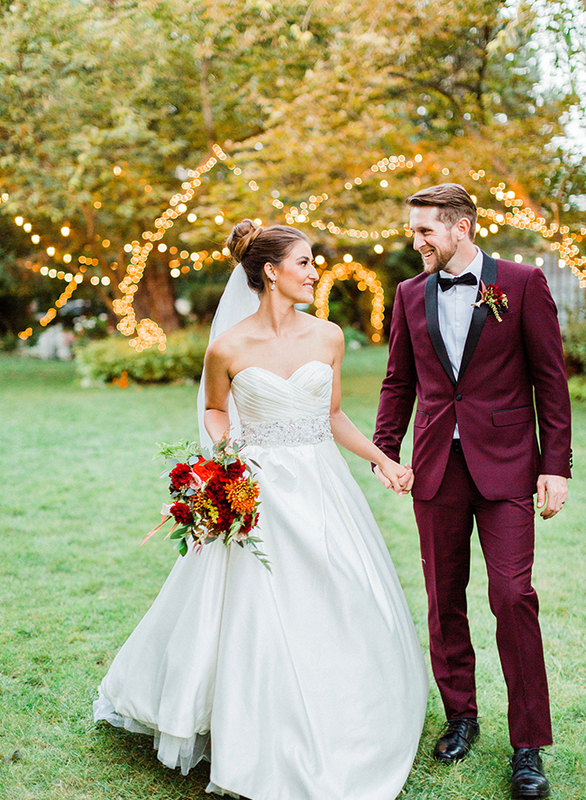 See this burgundy estate wedding or this rustic burgundy, purple, and gold wedding!